This story begins in mid-life. When my four-year-old daughter Marina and I moved to Kentucky from Los Angeles, a bit shell-shocked from a divorce and feeling, like Dorothy and Toto in the Wizard of Oz, very, very far from home, it didn't take us long to realize what wonderful neighbors we had. 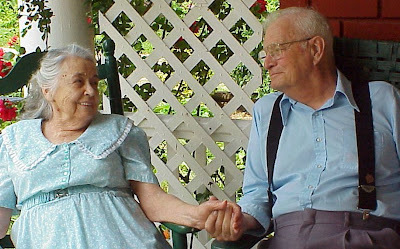 Living right next door were an older couple, Alma and George Johnson. Here's the type of people they were: George would carve small toys and leave them in the crook of the tree out front for Marina to find "from the fairies". When times were tough, Alma would cook delicious country meals and invite us to "pull our coats off and stay awhile". In short, they took us in and showered us with love at every turn. It wasn't long before we all ended up adopting each other. A few years later, Alma became very ill. By then, I had remarried and moved to a farm nearby and was busy raising a new family and running a literary agency. But Alma, who was then in her eighties, needed someone to tend to her. The thought of having a stranger do this just didn't seem right, and so, for an entire year, I happily spent my days with Alma. It was one of the most beautiful, exceptional experiences of my life. While Alma talked, I listened. We laughed and cried as she remembered the difficult years of her upbringing, her days as a young girl dancing the jitterbug, and the joys and tragedies of raising thirteen foster children and two step-children. George joined in, too, telling tales of his years in the Navy, traveling from one exotic port to another and of his life as a piano-tuner. Unbeknownst to either of them at the time, I wrote it all down. Shortly before Alma died, I surprised them with a book of all their treasured family stories. Their gift to me -- of sharing themselves so richly, so openly -- profoundly affected my life. I realized then that as a writer and a storyteller, helping others find and express their own histories in creative and perhaps unexpected ways would some day become my way of making the world a better place. This is the simple origin and intent of Bio.Graphia.